What is PPC Advertising and its benefits for your business? Have you heard about PPC Advertising? Are you curious to learn more about it? Or you are already aware about what is PPC Advertising, and want to implement it to market your business? This is the right place to get answers to all your queries. First, let us define PPC and create a basic understanding of how PPC advertising works and its benefits for your business. PPC stands for pay-per-click. Pay-Per-Click is a model of internet marketing under which advertisers need to pay a fee each and every time any of their ads is clicked. Basically, this is a method of buying visits to your website, rather than trying to “earn” those visits progressively. Search engine advertising is the most popular form of PPC advertising. Under this method, advertisers can bid for ad placement in the search engine’s sponsored links. Each time someone searches a keyword which is related to their business offering, their advertisement will be reflected for the viewer to click on. Each time your ad is clicked and a visitor is routed to your website, you will be required to pay a small fee to the search engine. It the PPC is working properly, the amount you pay for the fee is trifling, because the direct visit you get to your website is worth much more than what you have paid for. In simple words, if you have to pay $3 for each click received, and the click results in a sale of $300, then you have made a substantial profit. PPC advertising allows one to plan an extremely precise targeting of their customers. One can target their customers based on demographics, interests, or what kind of devices they use. This is very important as more than 50% of paid search clicks happen through searches made on mobile devices. One can also target their potential customers depending on their behavioral activity by using retargeting. This is an effective strategy to be used on visitors who have already shown an interest in your product, but have not completed a sale or proceeded to checkout. The worst fear a businessman has regarding advertising is the nasty surprise of a huge bill. 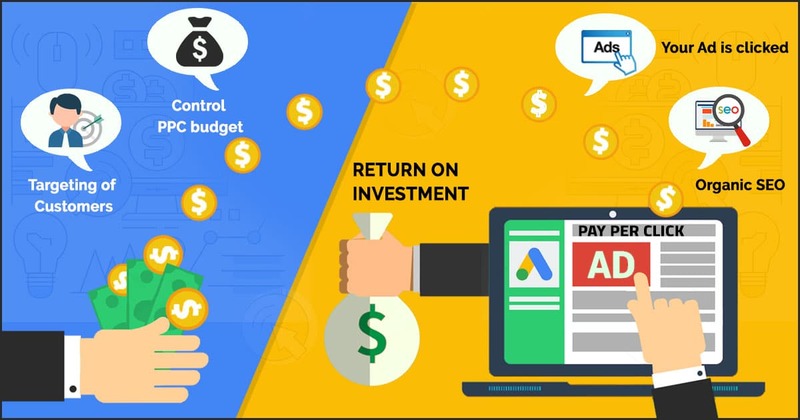 However with PPC Advertising, you can have total control over your expenses and your budget. Using PPC, you will be able to set your daily and monthly budget, so you do not have to worry about unforeseen or unplanned costs which you can’t afford. Another amazing feature of Pay Per Click (PPC) budgeting is that you can edit and adjust the settings anytime. Once you start seeing results, you can increase your budget to capitalize on your positive results. Always remember that the higher the budget, the more times in a day your ad will be reflected. You need to pay to the search engine only if someone clicks on your Ad and is routed to your website. You will not be charged for people viewing your Ad. Visitors need to click on your ad for you to get charged. This results in higher ROI. As compared to offline marketing or regular marketing methods where you have to pay for the flyers, or print advertisements or postage cost each time you target the audience, PPC Advertising saves that unnecessary cost for you. Combining PPC with organic SEO is like a match made in heaven. Organic SEO takes a long time to get noticed and to climb up the Google search results. At the same time PPC gives you instant results. You can reach directly to the top of google search for your keywords. But as soon as you remove your Adword campaign, you will also lose that top spot – unless you’ve been working on your organic SEO side by side. Why do all businesses invest in marketing or advertising? The answer is for an ROI (return on investment). Using PPC Advertising your ads will get an opportunity to be placed in a relevant spot. For example you are a seller of Cars, if you have paid to use that keyword and someone searches for that word online, your ad will immediately appear in front of them. This shows that your ad was reflected in a relevant place in front of a relevant person. If you are looking for support with PPC advertising and other online marketing activity, you can get in touch with us to discuss the best options for your business. Velocity Consultancy is a Mumbai based SEO Company offering cost effective website promotion services to our clients globally. We carry a result driven approach in order to achieve Top Search Engine rankings for our clients. Our technical expertise for Search Engine Optimization (SEO) with planning is custom-made and unique for each project helping us to ensure good ranking results to our client’s website promotional campaigns. Velocity Consultancy can help you in creating the best websites which can offer you the best balance between SEO and the latest trends in designing. PPC stands for pay-per-click. Pay-Per-Click is a model of internet marketing under which advertisers need to pay a fee each and every time any of their ads is clicked. Basically, this is a method of buying visits to your website, rather than trying to “earn” those visits progressively.Search engine advertising is the most popular form of PPC advertising. Under this method, advertisers can bid for ad placement in the search engine’s sponsored links. Each time someone searches a keyword which is related to their business offering, their advertisement will be reflected for the viewer to click on. Previous PostPrevious What is Google My Business (GMB) and its importance for your business?